I use the finest woods available to me. I source Alder, Swamp Ash and Mahogany from the best suppliers who have the knowledge, stock and experience to provide me with stable, consistent and beautiful materials. I have also expanded my choices of timber to include British woods such as Poplar, Horse Chestnut, Sycamore, Walnut and Ash. I have also sourced Plum for fingerboards. These woods are perfect for electric guitars, they are wonderful alternatives to the usual American types. I am also very proud of my roasted maple that I import from Canada from the incredible Hades Roasted Maple company. 'Roasting' involves heating the wood in an oxygen-free oven. This process provides a far more stable piece of material, changes the colour to a beautiful coffee/chocolate hue and gives it an incredible smell! The quarter-sawn flamed pieces make the most beautiful necks that I have ever seen. Highly figured, curly and birds eye are also available, along with fingerboards made from highly flamed maple too. The neck is where we have the most vital contact with our instrument. I finish my necks with a combination of oil and wax. This is applied in such a way as to retain the natural feel (and wonderful smell) of the wood, giving a lightning fast playing surface without the sticky feel that nitrocellulose can give you. 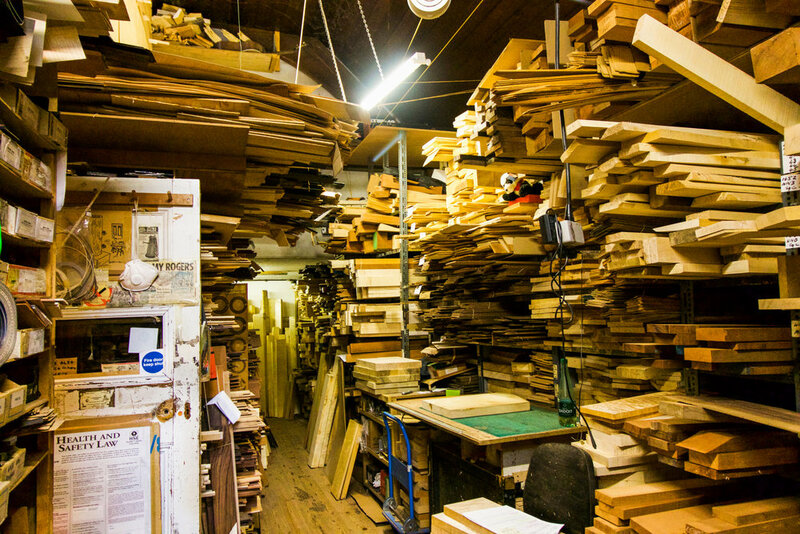 Just a tiny selection from one of the stock rooms of guitar woods at the Luthiers Supplies stock rooms run by David Dyke. What David does not know about guitars woods, is not worth knowing! I finish my guitar bodies with nitrocellulose lacquer - just as the classic models that we all know and love. I find this finish to be thin enough to let the instrument vibrate to its fullest potential whilst giving the most incredible buffed shine. I love the classic Dupont inspired colours from the 50s and 60s as well as the see-through finishes from those early Fullerton models. Of course, you can choose any colour that you like! I use Callaham and Wudtone hardware on all my Emperor guitars. In my humble opinion, they make the best stuff out there. Their bridges and tremolos are made fantastically well and their cryo-treated pots and electric parts are wonderful too. I use Sperzel locking tuners on my tremolo-equipped guitars and I tend to stick to Gotoh vintage tuners for T-type guitars - your choice of course! As for pick-ups, I have tried and played dozens of pick-ups from many of the top manufacturers over the years. I now favour Radioshop and Bare Knuckle pickups. They are handmade to order here in the UK to the highest possible standard and they now make my favourite single coils, P90s and humbuckers. We can blend humbuckers, form HSS sets and more esoteric combinations to suit any of your sound requirements. I believe that corners cannot be cut when creating a truly excellent guitar. Every element from the fret wire to the output jack helps to shape your tone. At Gray Guitars we do not compromise.